NEW YORK -- Andrew McCutchen admitted Saturday afternoon that he was nervous as he put on his pinstripes for the first time, officially starting the once-hoped-for New York Yankees phase of his career. "I feel like a lot of baseball players want to throw on the pinstripes for who knows how long, just to say you did it," the 10-year veteran said. "It's a really surreal feeling for it to actually come to fruition. "A day I'm not going to forget, for sure." As he addressed reporters ahead of Saturday's game against the Detroit Tigers, the former National League MVP was capping 48 of the wildest hours of his career. He went on to appear atop the Yankees' batting order, going hitless in three at-bats of a 2-1 victory while playing right field. "I didn't have the game that I wanted personally for my first one, but we got the win," McCutchen said. "That's what's most important." Two days after enjoying a home off day as a member of the San Francisco Giants, he was more than 3,000 miles away from his wife and 9-month-old, hearing Yankee Stadium's famed "Bleacher Creatures" endearingly bellow his name. After a warm ovation that preceded his first at-bat, McCutchen kicked off his Bronx tenure with a strikeout. He was frozen by Daniel Norris' 84 mph slider that swept across the strike zone. The nerves, early on at least, appeared to be present. But McCutchen, an All-Star who carried the Pittsburgh Pirates to a trio of playoff berths in his nine seasons before getting traded to San Francisco last offseason, had no problem with the butterflies. "Nerves are a good thing. That's the way I look at it," he said. "If you get nervous about something, it's because you care about it. "In this situation, am I nervous? Yeah, I'm nervous. I'm on a new team, and we have an opportunity to do big things here." McCutchen, who has never played in a World Series, is looking to make his first postseason appearance since 2015. "I saw him for the three years that we played in September pushes, and he elevated his game to the next level," said Yankees infielder Neil Walker, who came up in the Pirates' system with McCutchen. "[He's] a guy that holds himself to a very high standard, always accountable, and he thrives in big situations and in the spotlight. "He proved that in his time in Pittsburgh, and it's going to carry over into this stretch for us." McCutchen certainly hopes he can provide that lift. "One of the key things I can bring here is just the charisma and having a lot of fun, making a lot of people laugh," McCutchen said. "They seem like they have a lot of fun here, so it won't be a hard adjustment to get along with all the guys." With outfielders Aaron Judge and Clint Frazier continuing to miss time due to injuries, the Yankees had been eyeing outfield help for much of August, general manager Brian Cashman said Saturday. More than a month ago, just ahead of the July 31 non-waiver trade deadline, the Yankees weren't quite as desperate for an outfield acquisition. At the time, doctors believed Judge (right wrist chip fracture) and Frazier (post-concussive migraines) might be able to rejoin the team in mid-August. Once that didn't happen and the Giants began thinking they were out of the playoff race, the push for McCutchen began. It intensified around 6 p.m. ET Thursday, when McCutchen was out with his wife, trying to enjoy a day away from the field. "We were out -- we were at Starbucks -- and I got the phone call that this probably could happen," McCutchen said. "I automatically didn't want my coffee right away. At that point, it was just waiting on a phone call. "I didn't get that phone call until the next day." After the trade became official Friday, McCutchen's to-do list suddenly included a task the bearded superstar was unfamiliar with: shaving. Before coming to New York, he wanted to be in full compliance with the Yankees' no-facial-hair policy. "It was weird as soon as I was cutting it," McCutchen said. "But the only thing I was worried about was my son. What was going to be his reaction? I didn't know. So I held him the whole time I was cutting because I didn't want to do it and be like, 'Whoa.'" During the shaving process, McCutchen sent a selfie to Walker, asking him if what he had on his face at that point would pass. Walker had to tell him, "No, keep going." McCutchen did. After staring at and then touching dad's freshly shaven face, Steel McCutchen got used to the new look. His father is beginning to get familiar with it, too. "I look a little younger, I guess, some people say," McCutchen said. "So why not?" Hours after his shave, McCutchen was on a plane to the Big Apple. But he'll be heading back to his family soon. The Yankees open a three-game series at Oakland on Monday. "A lot of travel," McCutchen said, "but I won't get any of those points for traveling." Cashman said Saturday that the timeline for Judge's return still has no definitive date. 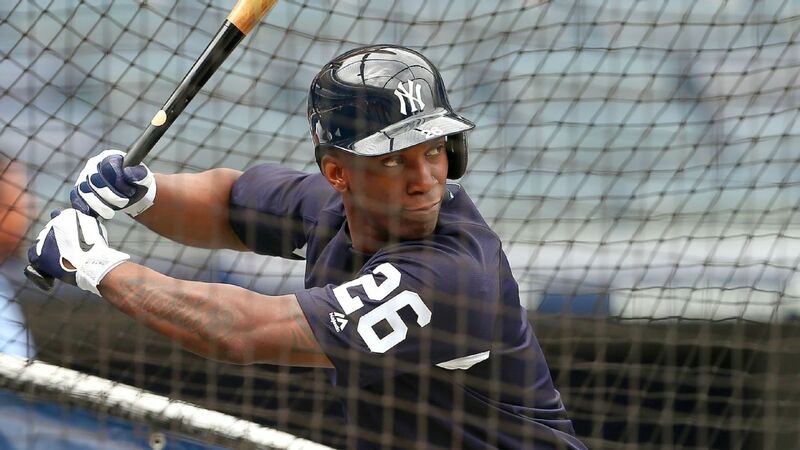 Until that day comes, McCutchen will serve as the Yankees' regular right fielder. Originally, the Yankees believed Judge would be out for only three weeks. It has now been more than five weeks since his injury. "I feel bad for him," Cashman said. "Judge will take as long as necessary. If it's not right, it's got to be right, or you won't see him. But the anticipation is that we will see him. But now we're in a better position to allow it to play out with the acquisition of McCutchen. "All I can tell you is that at some point, you'll see him again. That's what they're [trainers and doctors] telling us. That's all we can hope for, and the only thing I can do is keep my fingers crossed that that time will be sooner than later." McCutchen also hopes that comes soon, and he said Saturday that he has no problem taking a backseat in right when Judge returns. He was aware when the trade happened that he likely would be relegated to a bench role once the slugger was healthy. "I'm accepting of anything that's going to happen," McCutchen said. "If that means being a guy that plays every so often, I'm fine with that. I'm just trying to help the team any way that I can. That's the job."